What is important during pre-press? How can I optimize my processes in screen printing? How can I create professional stencils? 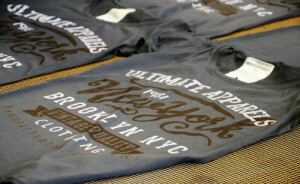 What are the pros and cons of using plastisol or water based inks? All questions that every screen printer is asking – independently if they are newcomer, advanced printers or professionals. There is always something to get better! The experienced screen printer Thomas Mosner shares during the seminar ‘Screen printing in practice’ his experiences, he shows process steps for creative and professional screen printers and explains the work-flow from creating the screens and the designs up to the final printed result on fabrics. The event for design, networking and further training will take place on March 16th, 2019 in the textile printing shop Dakota in Köln-Rodenkirchen in Germany.